The U.S. Postal Service has proposed a significant increase in the price of postage, the largest since 1991. If the proposal is approved by regulators, the changes will go into effect on January 27, 2019. The cost of a First Class stamp will jump from 50 cents to 55 cents. 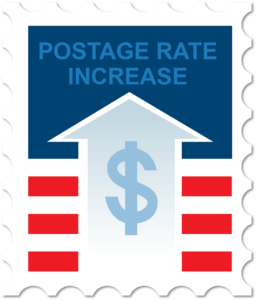 Postage for metered letters will increase from 47 cents to 50 cents. See all the proposed new pricing below. Note that there’s a bit of good news: The cost of additional postage for letters weighing more than 1 oz. will actually be reduced — from 21 cents to 15 cents. Also, the cost to mail postcards and international letters will hold steady. While the cost of mail may be rising, its value for marketers remains indisputable. According to the Data & Marketing Association, the direct mail household response rate is higher than ever at 5.1%. Compare that to the response rates for email (.6%), paid search (.6%), online display (.2%) or social media (.4%). Learn more about this potential price change on USPS.com. Get the most out of your investment in direct mail. Work with us and unleash the power of Digital Dog Direct.